We keep meaning to head down this-a-way. Truth be told, you need the weather on your side if you're going to risk an alfreso lunch, and today looks OK if a tad brisk. 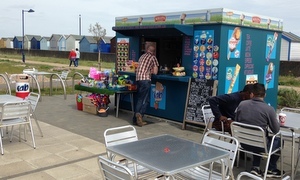 Andy pulls over this side of the refurbed coastguard tower leaving YT to jog half a mile into so-called Martello Park where, happily, there stand not one but two eating spots. One's open. That'll suffice. From the French "kiosque", a bandstand, North Kiosk (board says Georgie's) is doing business on this breezy Friday. Hardy Felix folk are seated and supping. Flying rings, beach windmills and colourful buckets are on sale. Precious little savoury food, alas. Not really their bag, I guess. Kettle chips, it is, with the need to hang on to the pack lest those tasty potato slices sail off towards the continent. Short walk back past the retro Fab upright bin for sweet stuff. Now we're talking. Various pre-wrapped offerings but good to see a selection of freshly made curiously cuboid cakes on the counter. Vic sponge and piece of chocolate, if you please, both decent with a better than expected push-button latte. So, a far cry from The Dip though perfectly fine if you're up this end of town. Still in need of salt, we called in at Huckleberrys on Beach Station Road for some fine takeaway baps. Sad to hear that mother and daughter are selling up after many years. Best of luck to both of them. If it was a car -- Vauxhall Movano. If they were passing by -- Tim Key.